This week, we are launching a number of changes to our Covenant Tulsa retail environment – particularly Events and Memberships – and these changes represent a philosophical shift in our understanding of how best to generate deep connections and long-lasting friendships over tabletop games. This is by no means a declaration that “alas, we have solved the retail puzzle!” but instead one of many steps toward a better model that serves a greater proportion of the Tulsa community. So, let’s take a look at what is changing and why. The dissonance lurking just under the surface of standard tabletop gaming events is something that has been bubbling up in recent years. Like many of you reading this, we mainly grew up in the “tournament” culture and never questioned its merits. We put together our best decks, sat at a table for 8-12 hours straight, and assumed that the pinnacle of gaming was the adrenaline rush of competing. But in the past 7 years, this assumption about competitive play has been fully and uncompromisingly deconstructed. Competitive events play an important and valid role, but they are not the preferred style of event for most players (by a longshot) and they are among the least effective at growing and sustaining a player base. Data in this industry skews heavily toward those who are self-reporting in local store environments, but it does not (and perhaps cannot) account for those who choose not to play locally, or at all. These questions have dramatically different answers, and the changes to our events are an attempt to answer the latter and the former. It is crucial to solve for both. Standard weekly events no longer link prize distribution to performance, allow for deck/list switching between rounds, and rotate through a variety of formats – including official prize kit events, new player events, release events, limited events, and custom non-official formats. Competitive events (Store Championships, Regionals, etc) remain a key component of the event calendar, and now serve as a more significant and unique opportunity for players to compete. These events will be run according to all official rules and requirements. Weekly game days have been adjusted to better promote community crossover and reduce conflicts. Of course, you can still come in anytime and play anything you want. The quarterly, universal league is no longer active in favor of better per-event prizes. Current league points must be cashed in by May 12. This shift better balances the incentives for store attendance by adding more events that every type of player can attend and enjoy. The majority of events allow for the exploration of new decks, lists, and themes without worrying that they might not be “the best”, while the more serious, competitive events still satisfy the need for players to test their mettle in a more high-stakes environment. All of this stems from our belief that game nights should be a relief from the day-to-day stress of modern life, a time to connect with new and old friends and get lost in universes that we all love, together. Even so, this is undoubtedly only the beginning. One consistent chorus that we’ve never deviated from when it comes to local retail is the hazard that shops face when their model relies almost exclusively on MSRP product sales, or product sales at all. In response, we’ve had some variation of a membership model from the beginning. The problem with memberships is finding the perfect balance between value gained for members, revenue gained for us, and the level of scale needed to actually create a sustainable store model. At the same time, when you start restricting access to tables or games by making them members-only (or heaven forbid, start charging table fees), you risk alienating players new to your store or, more importantly, new to the hobby. We want more people to be involved in tabletop, and the reality is that you are going to lose a lot of would-be community members if you are expecting to make money on those early interactions. These changes to membership incentivize new players getting involved in the community with free starters, discounted events, and referrals, while also giving member-exclusive benefits for investing in the space. A new member, at the time of sign up, receives one free Starter for the featured title of their choice (up to a $40 value). Free in-store pre-orders and special orders for any tabletop game or accessory, regardless of if we normally stock it. If you want to get a friend or co-worker involved in a game that you play, it is now easier than ever. For $15 upfront, they can start playing right away with their free starter set and jump into any weekly events for free the entire month – and you get $10 in store credit for getting them involved. These changes are all about making it easier to get more people involved in the games you play – which should be the critical value proposition of every local store. This new store environment is a response to the feedback we have actively gathered over the last year, both objective and subjective. We are determined to make Covenant the best place in the world to connect over tabletop games, and that includes bringing new people into the hobby. As we continue to gain insight from our incredible locals, speak to those inside and outside the industry, and ask ourselves hard questions about what we are doing and why, Covenant Tulsa will keep evolving. Come in and experience this new approach for yourself, and let us know what you think! All of this has been such a wild ride, and it is about to take yet another turn! At the beginning of TC, we started blogging about Monsterpocalypse and picked up an amazing group of commenters/friends who connected with us and each other. That led us to implement the ability for everyone with a TC account to write blogs and have them posted right on the front page of our site. The response was incredible. So many phenomenal blogs were posted, from general strategy discussions, to list building, to following along with the Mastering Monsterpocalypse series. The community, centered entirely around Monpoc, was like nothing we had ever been a part of. Then the game died, and almost immediately X-Wing took its place. Theorist started rolling out with his renowned X-Wing analyses and vassal tournaments and mu0n took over the vassal updates and posted them religiously, alongside Froggies, SableGryphon, and thousands of other X-Wing players (too many to mention!) who wrote and engaged along the way. Then the podcasts showed up; from Scum and Villainy, to Breaking News, to Knights of Ren and many, many more. We listened to and shared in the mutual passion of those productions. Unfortunately, the entire “user blog” infrastructure was built on a house of cards. We were inexperienced and strapped for resources when that functionality was implemented, and the complications of having such a complex codebase added to a relatively minimal blog were not understood at the time. The complexity grew bigger and more tangled every day, with each new user creating rows upon rows of tables in our beyond-bloated database. When the problem finally started crashing the site (and our store with it), we reached out for a solution. We discovered that creating a simple backup of our database was not even possible without bankrupting ourselves, as its size was outside the bounds of traditional processes. So we basically had to decide whether we should nuke all of the site’s content and start over, or try to salvage what we could and migrate it to a fresh database. We chose the latter, and over the course of a year carefully worked with our newly-found development team behind the scenes, exporting and importing users, categories, posts, comments, messages, products, etc. to a clean build. At the same time, spam became a tremendous problem. Because every new user could post blogs and compose private messages, a large number of our customers, many of which had no idea that user blogs even existed, started getting all sorts of ridiculous solicitations – with the Team Covenant header attached. We had no way to implement countermeasures without adding more code and potentially crushing the site, and we were getting blacklisted by email providers – so we turned off private message notifications entirely, and restricted new users from being able to post blogs. 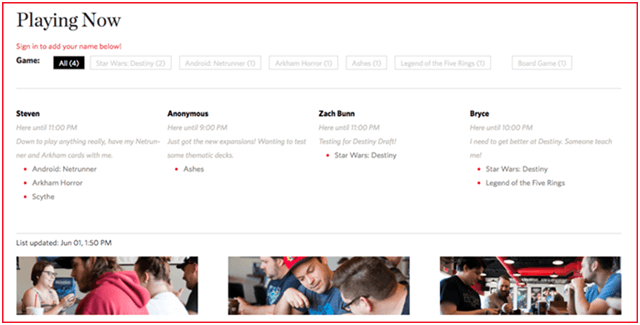 In this same timeframe, tabletop gaming conversations started moving organically to other dedicated discussion platforms, like Facebook groups, Discord, Reddit, and Medium. With no new users being able to post blogs, no private message notifications, and a slow exodus to more dedicated platforms, activity on the site kept trending downward – and rightly so. We finally got every blog, comment, user, message, etc moved over to the new database. Some comments were in the wrong order or assigned to the wrong blog, and many of the categories did not get properly assigned, but the content was saved and years of posting successfully backed up. Unfortunately, we had exhausted all of our resources to do so. This meant that we could not focus on user experience improvements, and instead had to settle for what we had pretty much out of the box. We made small improvements where and when we could, but we ultimately knew that our users, like those on many other smaller discussion platforms, had largely moved on. Much of this was due to the restrictions that we had to make and our compromised user experience, and the rest was a natural, internet-wide migration to the bigger, dedicated discussion sites. Given this reality, coupled with the fact that the user blogging functionality consumes over 40% of our server resources, we will be revoking the ability for users to post blogs and removing that framework entirely. What happens to the current user blogs? In late Q4, we are planning to move the archive of user blogs to https://communityarchive.teamcovenant.com. They will remain there for an undetermined period of time, and in all likelihood will eventually be deleted. If you wish to keep your blogs, we encourage you to copy/paste your content to other platforms or your own personal hard drives. You can find the listing of all of your posts by going to the following url: https://teamcovenant.com/members/YOURUSERNAME/ and selecting “posts” from the dropdown. We can also furnish a WordPress blog backup file to anyone who requests one. The resulting .xml file can be uploaded to any WordPress site to import all of your TC posts, or parsed for the blog text. We cannot provide a copy of your comments and/or private messages, though the former do export with whichever blog they are attached to. It is our hope that those of you who are still blogging here (Theorist, mu0n, Jason) will take your content and start your own personal blog on WordPress, Medium, or elsewhere. We will facilitate this as best we can. We cannot adequately state how wonderful it has been to see these various communities develop over the years, and how thankful we are for everyone’s willingness to share their thoughts and to connect with each other through our cobbled-together platform. It was so formative for all of us at TC, and we wish that we did not have to make this decision. Special thanks to Theorist, who was undoubtedly the most instrumental contributor to this community from the beginning; if not Monsterpocalypse and X-Wing more generally. You are an amazing writer and thinker, Jeff. We appreciate you. For questions about how this impacts you and/or to request a WordPress backup file of your blogs, reach out to archive@teamcovenant.com with your username. In March 2012, after five years as an online-only retailer, we opened a little gaming space called Covenant Tulsa. It was our entry into an entirely new world of brick and mortar game stores. Almost immediately, we started receiving a surprising number of calls. People wanted to know what we sold, what events were happening, and how we made money without selling Magic. You know, the usual. But over time, the calls started shifting to questions about who was in the store and what they were playing. “Anyone there for Game of Thrones?” and “You know if anyone is coming in tonight for X-Wing?” became the norm. Given the minimal staff at the time and the close-to-overwhelming volume of calls, we recognized the need for tools that solved as many questions as possible before help was needed. This led us to streamline our event calendar and league, simplifying both and making them universally accessible online. We also created the Covenant Tulsa Players Facebook group so local players could coordinate when and what they would be playing at the store. While the Facebook group was (and still is) extremely useful, it was all too common that someone would show up, post to the group, and not find another person to play with. The number of replies to a “playing in the store tonight!” post that equated to “sorry I missed this – would have been there but saw this too late!” became a clear sign that Facebook was only a piece of the puzzle. Local players needed an easier, faster way to connect, and it all revolved around access to some very basic information. Are there people playing right now? How long will they be there? I am here and looking to play the following games. I am testing for an event, looking for casual games, building weird decks, etc. I will be here until this time. So we built a platform that seamlessly allows for this exchange of information to occur. Introducing the beta version of Covenant Play – now available to all local players! 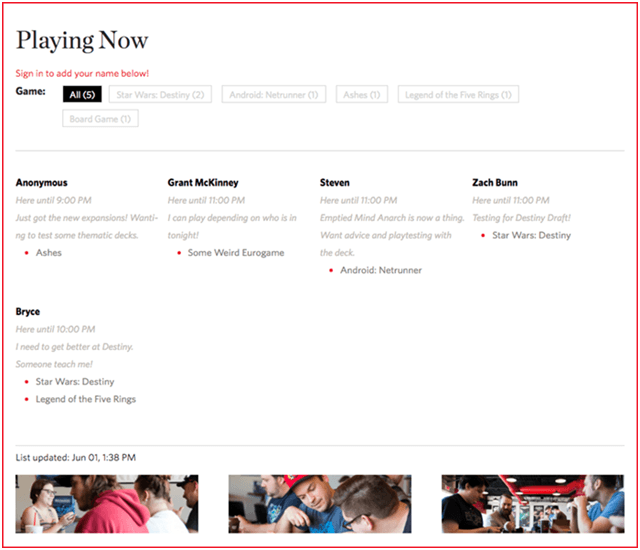 Covenant Play is a browser-based, mobile-optimized tool on our website that allows you to instantly communicate the most important details of your in-store gaming experience. Check out how easy it is to use! First, when you arrive at the store, sign in to Covenant Play at playing.teamcovenant.com, accessible via “PLAY” in the header. This requires a free Covenant account and a one-time authorization for Covenant Play to access that account. Once signed in, click Start Playing. 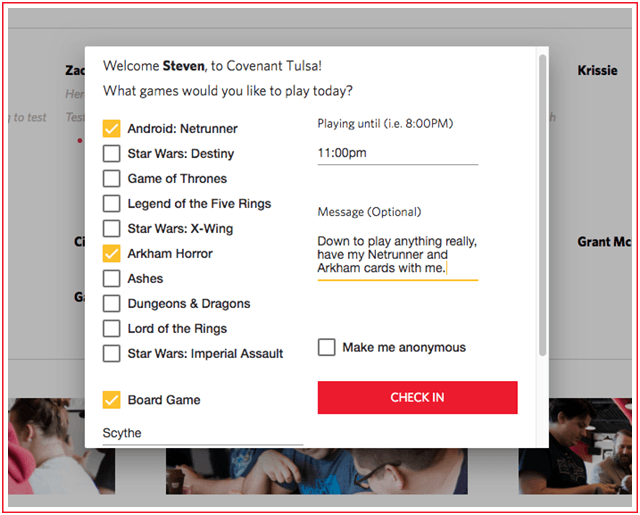 This pops up a modal in which you enter all relevant information, starting with the games you want to play. You can choose from any of our supported games, as well as a fully-customizable Board Game and Other Game field. Once you have chosen the games you would like to play, let others know that you will be Playing Until a certain time. You will automatically be signed out at that time. Next, you have the option to provide a custom Message that gives context to the experience you are looking to have. Just want to play some fun decks? Needing to test a certain list heavily before a competitive event? Hoping for 2 more players to join your Dungeons & Dragons campaign? New to a game and needing a teacher? List it here. Finally, you can choose to display the name associated with your Covenant account or simply be listed as Anonymous. Whether or not your visit is public information is completely up to you – and you can find players regardless! When you click Check In, your name is added to the list of players on the Playing Now page. Other players can now see the games you want to play and head down to the store to join! We are truly excited to get Covenant Play into your hands. As noted above, though, this is still very much a beta release in active development. Our product roadmap on this is extensive, and we have big plans for where it goes next. Those choices will be influenced by how the Tulsa community uses it and whether or not it is effectively solving the problems listed above. There is only one way to know for sure, and that is to release it and observe. So what are you waiting for? Start playing! Note that we are not accepting applications for this position at this time. From the beginning, we have prioritized content creation as an integral part of our contribution to tabletop gaming. Now, having expanded into multiple channels – YouTube, Facebook, Twitter, Instagram, and, of course, our website – we need a passionate, eloquent, and hard-working team member to coordinate (and contribute to) these efforts. Our Marketing team builds awareness of the Covenant brand and clearly communicates the value of our products and services. As Content Manager, you will be responsible for developing and executing content strategies (including PPC) that achieve these objectives. You will take lead on all written communication and so should be extremely comfortable writing blogs, product descriptions, press releases, emails, advertisements, and social media posts without any grammatical errors and in accordance with SEO best practices. You will directly manage all social media accounts. During a product launch campaign, for example, you will determine what content needs to be created in order to effectively market the product in the deadline given. You will work with our Lead Designer and Video Producer to facilitate the creation of all desired non-written assets (promotional pictures, product videos, graphics, website images, etc) and then produce all necessary copy (announcement blog, product description, Facebook ad, email newsletter, social media announcements, etc). You will then launch the campaign, analyze the results, and adapt as needed. We are pretty data-driven, so be ready for that. While no person can perfectly embody every one of these values in every moment, a Covenant employee is expected to have a natural inclination toward them and a desire to actively cultivate them in all aspects of their work. Interested? Submit an application below! New Tokens For The Holidays! The Holiday Token tradition continues with fresh sets compatible with Star Wars: Destiny, Arkham Horror: The Card Game, Star Wars: X-Wing, Ashes: Rise of the Phoenixborn, and Android: Netrunner. The latter also gets an extra special surprise – the launch of revised Data Tokens! We just love white acrylic so much. That clean, high-contrast background makes every design come to life. Throw the festive colors into the mix and it is hard to resist bringing a little holiday cheer to the table this season! This year we focused on holiday themes that could be bundled together into full sets. Saga Tokens and Arcane Tokens get the full treatment, Mythos Tokens get a cheery Investigator Set, Data Tokens sport a new white-out Credit Set with revised designs (see below), and Squad Tokens add the only holiday-themed Shield Token that we have not done – bright santa red! These tokens will only be available during the holiday season! You can find out more by visiting our store, or browse directly below. We could not be more excited to announce a comprehensive update to our Data Token line. Five years on the market, Data Tokens were our first real token offering, and one of our absolute favorites. 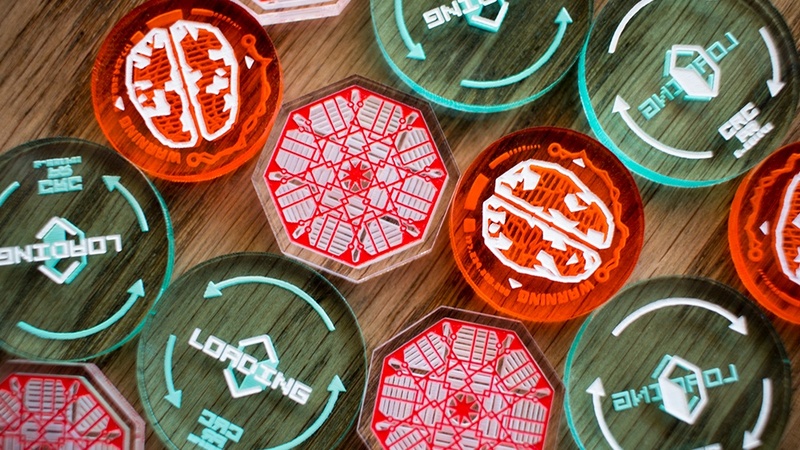 With Netrunner getting a comprehensive update of its own, we went back into the lab and optimized every line, angle, font, pattern, and arrangement on those original designs, producing a set of tokens that demonstrates how much the little things truly do matter. 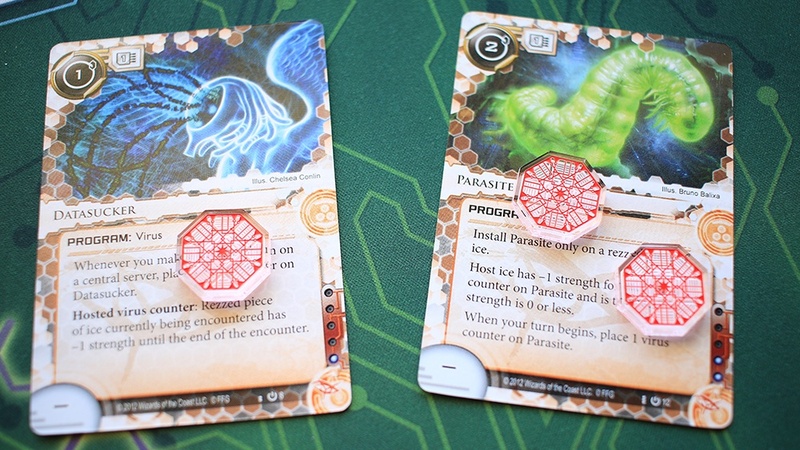 Data Tokens still carry the iconic designs that have graced thousands of Netrunner tables over the years, but like the game itself, the fundamentals have been tightened up. Line thickness is now consistent and more crisp, the angles are standardized (note the Brain Damage, Tag, and Power Token triangles), the numbers and letters are uniform, and the patterning and spacing is aesthetically improved – and mathematically perfect. The 2-Credit and 3-Credit have flipped colors, finally, so that Green Level Clearance nets a green token and Blue Level Clearance nets a blue token. Even though the latter has rotated, Green Level Clearance in the Revised Core makes it worth the change. Similarly notable, both the Bad Publicity and Tag tokens are smaller, crisper, and more intensely parallaxed. While nothing compares to seeing the real thing, check out this bare bones comparison of the designs. Though subtle, the overall effect of these changes looks simply phenomenal on the table. A sleek new look for a newly revitalized game. You can check them out in further detail on our store, or buy them directly below. We send each of you the warmest of holiday wishes this season, and hope that each day is filled with immense happiness and great games. Thank you for all of the incredible support over the past ten years! Posted in CovenantTagged Announcement2 Comments on New Tokens For The Holidays! Exciting news! Due to the support and passion of our customers, we are adding additional seasonal staff. Our Operations team needs diligent, meticulous, and focused individuals who share our passion for unrivaled quality and service with an inclusive and positive attitude. We are seeking a handful of employees who are ready and excited to contribute to Covenant on a recurring basis! The Operations team is responsible for the the tangible delivery of the Covenant brand, which is no small task. Our in-house directive is to leave nothing to chance, so only apply if you thrive in demanding environments. As a Seasonal Specialist, you will be responsible for unpacking, unboxing, and organizing inventory during busy seasons of the year. This role may be expanded based on performance and may offer work throughout the year. We Are Doing A Reddit AMA! On Tuesday, April 25th, starting 11AM CST, we will be on /r/boardgames for an AMA (ask me anything). We will be fielding any questions you might have for a few hours, so stop by and ask away! Posted in CovenantTagged AnnouncementLeave a Comment on We Are Doing A Reddit AMA! 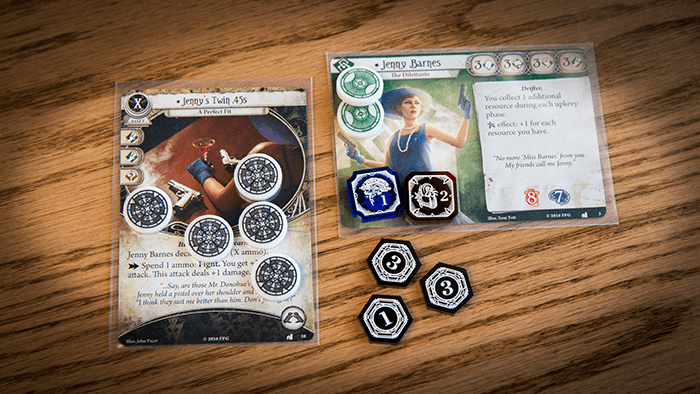 After falling in love with Arkham Horror: The Card Game, we knew that a set of tokens was on the horizon. Today, they have arrived. The Arkham universe is full of incredible opportunities. Its success relies entirely around the creeping, dreadful feeling that must manifest itself in every experience. Because of this, we doubled down on an art style that was both thematically appropriate and as evocative as possible. 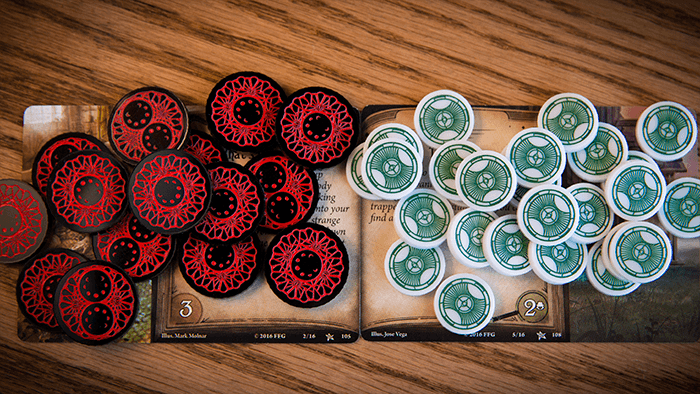 We also knew that we needed to make the tokens modular enough to accommodate between one and four players, and so separated them between Campaign tokens (used by the board) and Investigator tokens (used by each investigator). First up, the Campaign Set! The Clue/Supply token not only represents clues in a complex, enthralling way, but also introduces a new dimension to the game with its Supply side. During play, we were always pining about which stock tokens to use on cards with “charges” – everything from Flashlight to Shriveling to a .41 Derringer. Nothing seemed appropriate, and Resources sitting on assets was especially confusing. We designed the Supply side and placed it on the flip of the Clue to solve this problem. The detailed motif introduces elements that subtly represent various interpretations of “supplies”, and we often use them to mark damage on certain monsters – it looks like they are being blasted back into their own dimension. 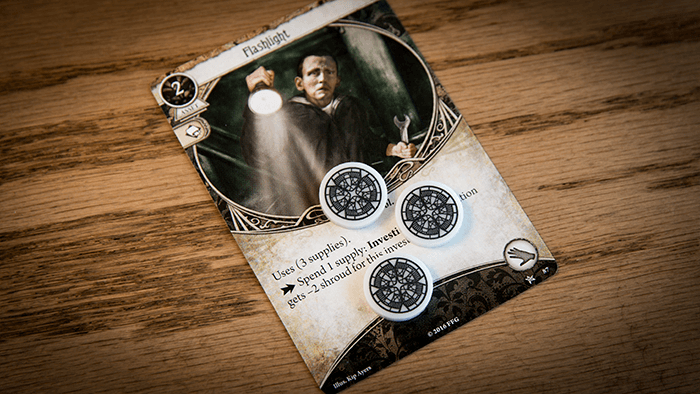 Additionally, the pearly-white acrylic shines in bright contrast to the darkness found throughout the game and the rest of the Mythos token set, which clearly demonstrates the positive in-game effects represented by both designs. By divorcing the Clue and Doom designs from each other, we were able to give the latter a proper representation on infinitely deep opaque black. The blood red paint fill and intimidating size appropriately complement the feeling of “pending dread” created by the lunar phasic artwork, and its convenient flip to 2-Doom causes the “clock is ticking” sensation to fully sink in. But just amping up the main area of play is only part of the experience. Check out the Investigator Set! 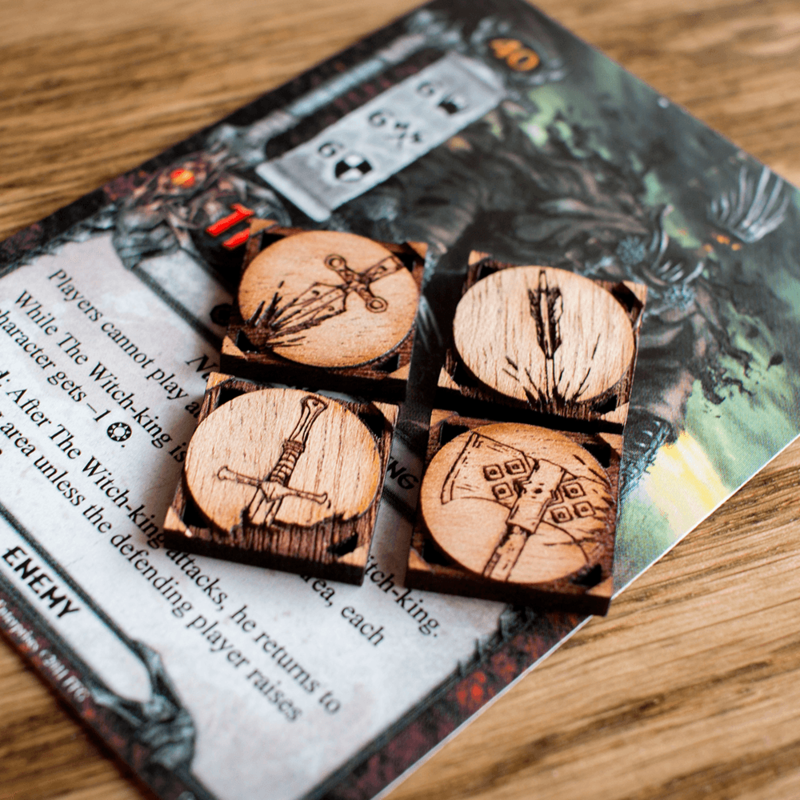 The Health and Sanity tokens bring unbelievably complex artwork to the foreground, making it all too visceral as each Investigator descends into injury and madness. Translucent acrylic, in dark red and dark blue respectively, make each token shimmer recognizably, while numbers on each side add an additional layer of clarity from across the table. A 1-side/2-side flip makes tracking as convenient as possible, and squared cuts allow for easy alignment, keeping everything tidy. 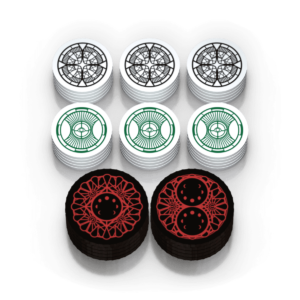 Translucent, dark green Resource tokens feature a clear numeral adorned with a highly detailed, universally appropriate border. Whether representing money, influence, connections, or arcane power, the Resource token makes calculation and decision-making as unambiguous as possible. Easily flip between 1- and 3-Resources, and watch as the border changes to accommodate! You can see Mythos Tokens in action, as well as a playthrough of the first scenario of Dunwich Legacy in the video above. Or, purchase directly below! We had an incredible amount of fun and discovery during this process, and absolutely love the end result. 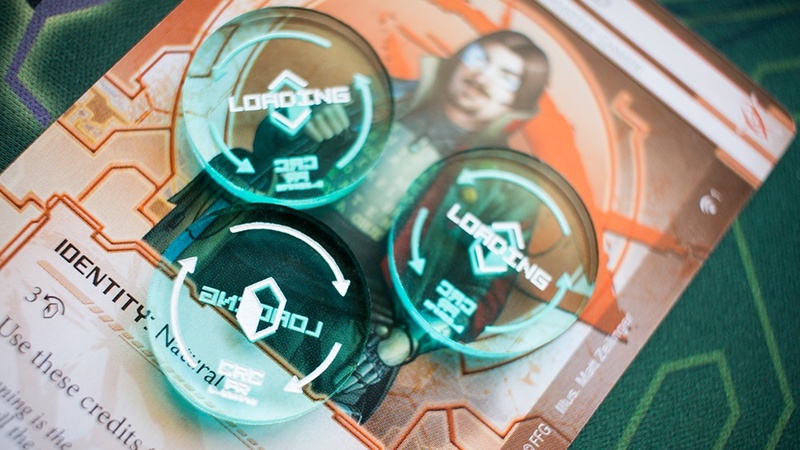 The functional improvements of flippable tokens, as well as the Supply design, serve as a perfect complement to the thematic look and feel of Mythos Tokens on the board. Huge thanks to our incredible customers – we cannot wait for you to get these tokens on the board! Be sure to share your experiences with us via Facebook, Twitter, and Instagram. More to come! Updated Data and Adventure Tokens! Exciting news for current and prospective owners of Data Tokens and Adventure Tokens! 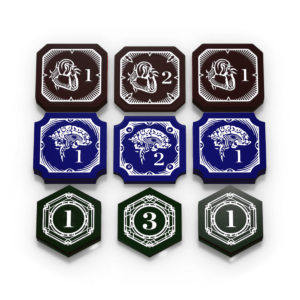 The Virus, Brain Damage, and Recurring Credit Data Tokens have received a design refresh, as have the Spear, Sword, Axe, and Arrow Damage tokens, the Treachery token, and the 5-Quest token from our Adventure Token line. We have added a Wild Damage token to the fray as well, since we often find ourselves fighting beasts that prefer claws and teeth to “sophisticated” weapons! Over the years, we consistently get better at design, and that recognition constantly gnaws at us when looking at older token sets. It is not unusual to walk past our current inventories and think “that is good, but we could do a little better”. When we have the opportunity, we take it. For the updated Data Tokens, we now offer a Virus that plays to the theme of the original, but brings home the controlled chaos that a virus represents. The design pulls from the imagery of classic logic gates and uses the Data Token parallax to impressive effect, creating a token with increased visibility and improved presence on the board. Similarly, the Brain Damage more accurately portrays the in-game effect it represents, and does so across five different, unique designs pulled from legit “pain-receptor” brain scans! The Recurring Credit has been moved from Dark Purple acrylic, a medium plagued with availability issues and transparency concerns, to a Light Green acrylic. This allows the parallax to function fully and beautifully without compromising the token’s clarity, and also provides synthesis with our other Light Green token – the Bad Publicity! Keeping track of those Bad Publicity Recurring Credits has never been easier! 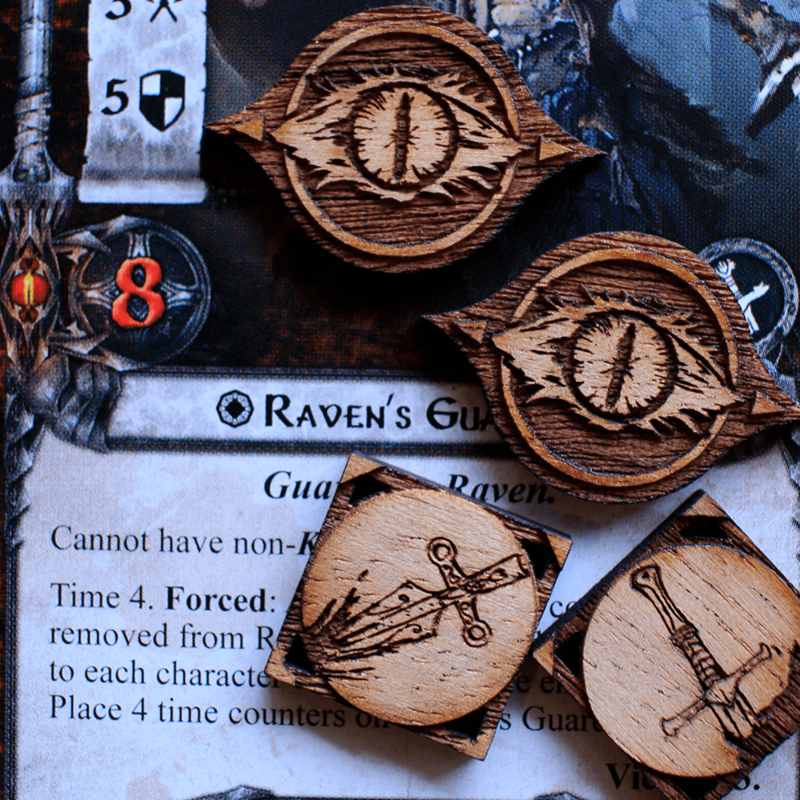 On the Lord of the Rings side of things, we changed the Damage tokens to intricate square designs in order to better differentiate them from their Cherry counterparts. We also made them a bit smaller in order to cut down on board clutter. There will never be any confusion as to what each token means on the board, and that makes every quest more enjoyable. While looking at the Damage with fresh eyes, we thought it only appropriate to add a long-desired Wild Damage token to represent the beasts commonly encountered in Middle Earth. Or, if you are so inclined, your own Beorn! While there, we made the Treachery Token more menacing AND more striking by adding a completely unique shape to the mix, and revisited the ambiguous “tree” design on our 5-Quest token, ditching it for a more thematic and unifying “leaf”-based design, inspired by random sketches from Tolkien himself! Progressing through a quest feels so much more natural now – we love it. 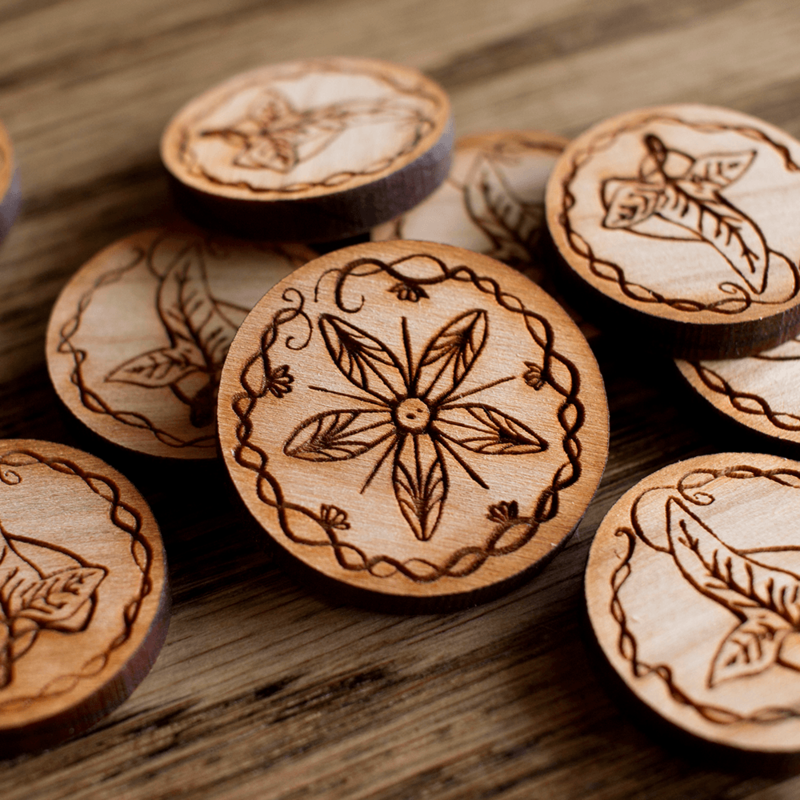 We are hard at work on new token lines and custom products, and cannot wait to share the fruits of those labors. We will continue to do everything that we can to provide the best tokens for the best games, and hope that you will continue to join us on this journey. More to come! 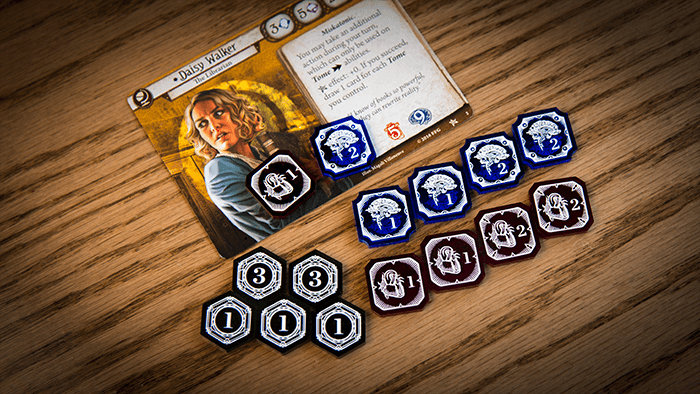 Posted in Android: Netrunner, Covenant, Lord of the RingsTagged AnnouncementLeave a Comment on Updated Data and Adventure Tokens! Back when we launched Banner Tokens, Christopher Giroir left a comment that had been echo’d throughout our office for many months. Can’t wait to see what you guys offer (hopefully soon) for gold and the other random tokens you need in the game. Playing with my cardboard gold next to these just doesn’t feel right! We looked at everything – from yellow and gold acrylic, to metal/challenge coin options, to wooden discs – and throughout the entire discovery process, nothing seemed to fit. The materials failed to deliver proper immersion in the Thrones universe, and we continued to run up against the reality that Westeros is a unique, well-documented place. You read about the various gold coins in the books and you physically see them in the show – these are tangible items impressed upon every Thrones enthusiast. Amid these frustrations, we continued to find the officially-licensed coins floating around online from a place called Shire Post Mint. 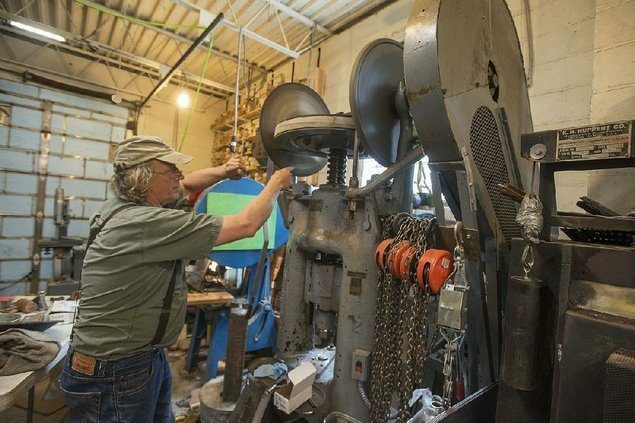 As we learned more, we began to deeply admire their methodology and commitment to making coins the old fashioned way, the real way, and their obvious love for the process. It is rare to find a company that cares as obsessively as we do about their offerings, and after a lot of research we reached out to see what was possible. As it turns out, everyone we spoke with at Shire Post Mint is fantastic. 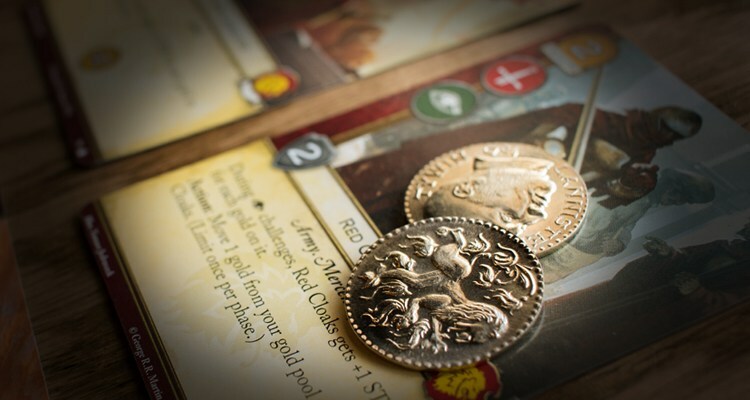 Not only are they our neighbors, only a few hours away in Springdale, Arkansas, but they also had a line of “gaming coins” that fit perfectly with our vision for gold tokens compatible with Game of Thrones: The Card Game. After those initial conversations, we read through each of the gaming coins on their website and excitedly found that each coin description described the history of the coin in Thrones canon. It is one thing to have the official “A Game of Thrones” license for these kinds of items and to start churning out anything that might be profitable. It is another thing entirely to invest so much care into the creation of each coin, and to make sure that it does justice to the source material at every turn. That pretty much sealed the deal. We are proud to announce that we have entered into an agreement with Shire Post Mint to be the exclusive US seller of these “A Game of Thrones” gaming coins! The official A Game of Thrones Half-Dragons and A Game of Thrones Half-Pennies come in sets of 10 and 15 respectively. Each coin is struck in brass on hand-engraved steel dies (check the video below to see this process in action) and has a beautifully realistic look and feel. They are, of course, officially licensed A Song of Ice and Fire merchandise. You can see all of the coins below in a single glance, or head over to our store to do some more in-depth browsing. Each has the descriptions that were a big selling point for us, so be sure to click in and see what each of these is about! Also take a look at our announcement video below to see what we have to say about them “in person”! We hope that we can do our part to get these coins the recognition that they deserve, and distribute them to Thrones fans far and wide. Huge thanks to Shire Post Mint for their dedication to the craft and willingness to partner with us on this endeavor. Of course, as Zach said in the video above, we owe each of you the biggest thanks of all. You are the reason that we keep moving forward and discovering how best to provide value to the tabletop space. Summary: We are migrating our store to a new platform. If you care about your order history, you will need to save that information manually before September 1st. Your continued support through orders and subscriptions has provided the resources needed to take a step forward on the web. We are exceedingly thankful that you find value in the philosophy that we are bringing to the tabletop gaming space, and are using this opportunity to further push our web presence forward. We were young, impassioned, and a little wild when we started the Team Covenant website, lacking both resources and understanding of the web. At the end of the process, we had a website that was pieced together over a few different platforms. This made many experiences on Team Covenant less than ideal, particularly the confusing separation between the store and the community. With this upcoming change, every element of Team Covenant is now on the same platform. The benefits of this are overwhelming. You can now engage with every element of the site from a single account, with faster load times and cleaner navigation, all within a unified visual style and hierarchy. There are significant out of the box improvements, too, like product reviews and support for multiple product images. In addition, we have moved to an optimized host and installed SSL certification sitewide, which will make future development expedient and ensure the highest level of security across the entire site. It is a significant step forward, particularly behind the scenes, and we are genuinely excited to make our web experience much more in line with the excellence you expect from Covenant. Once the new store launches (early September), you will be unable to access your current store information. This means that your past order history (and any saved addresses) will no longer be available. If you would like a copy of these items, you will need to manually record them from your Store Account page before launch (taking a screenshot of your orders works well). We made a quick guide outlining the process! We sincerely apologize for any inconvenience this causes. We looked at a number of options to remove this burden from those of you who enjoy proper book keeping, but each was overly complicated and ultimately out of reach given our resources. If you already have an account on teamcovenant.com, that account will work sitewide once the new store is launched. You are good to go! If you only have an account on teamcovenant.com/store, you will be prompted to create a new account when interacting with the new store. This account will be your official Team Covenant account, used for shopping, blogging, commenting, and every other function of the site that you wish to engage with. If you would like to verify that you already have an account and/or create a new one, visit our registration page. If you would rather not have an account, you can always check out of our store as a Guest. If you have any questions about the above, please give us a shout via our Contact Form. Over this past year, we have fundamentally rebuilt every aspect of our website in accordance with current web standards, with an obsessive focus on clean, minimal, and secure code. Launching the new store platform marks the conclusion of this major foundational work. These efforts have yielded a unified Team Covenant experience, one much improved for users and ready for hassle-free, efficient development into the future. Munitions are some of the coolest things in X-Wing, and with their relevance increasing over the next few months it is the perfect time to add these acrylics to your collection! Everything is designed completely to spec and in the artistic, representative style that we have used across the entire Squad Token line. Dropping these bombs really makes the board spring to life, and makes every X-Wing story even more enthralling. Take a look! We have also updated the Squad Token line with all of the previously missing tokens, including Weapons Disabled, Tractor Beam, Extra Munitions, and Initiative! The line is now fully up to date, and we will continue to add to it as needed. You can find all of these tokens on the newly updated Squad Tokens page! It is always such a pleasure to design tokens in a way that is all about bringing players deeper into every X-Wing match. We love it. If you would like to grab your favorites or the entire set, head over to the store! We deeply appreciate your business, and will continue enhancing the X-Wing experience as best we can. Posted in Covenant, Star Wars: X-Wing, VintageTagged AnnouncementLeave a Comment on Munitions Tokens Are Here!